What Cabinet is Good for Storing Exams? When you are trying to keep exam papers from being seen by prying eyes, a security cabinet is a great way to keep them safe. Desperate times call for desperate measures, as the saying goes. For some students, desperate times mean trying to get a look at exam papers ahead of time. For this reason it is important to secure exam papers in a safe and supervised place. This is especially important if you reuse exams each year, making the opportunity for cheating last all year long rather than just between exams days. Phoenix Firefox is more than just a catchy name; it is a name that is respected in the world of fire resistant safes and cabinets. The Phoenix Firefox SS1622K has a high degree of fire safety. The cabinet does not only protect its contents from direct contact with flames, it also protects them from heat damaged cause by fire. A typical fire can burn one particular area for up to ten minutes, but the Phoenix Foxfire protects its contents for up to 120 minutes for paper and 60 minutes for digital media. It also has a high security key lock so no one can get in without a key. Another trusted brand in the safe and cabinet industry is Chubbsafes, which has been around since the early 1800s. 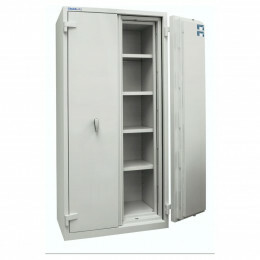 The Chubbsafe CS 320 is a small cabinet that is perfect for keeping in an office closet or storage room. It will keep documents safe for up to two hours and hard drives or other electronics for up to one hour. It also has a digital keypad for easy access for whoever has the code. That is ideal for a school office where many administrators and teacher need to access the cabinet. If you have a lot of exams and documents to store or if want to share a cabinet with many people you will probably need something a little bigger. The Chubbsafes Duplex is 1950mm tall and has ample room for a plenty of documents and exams. However, it does not sacrifice safety for size. The cupboard offers 60 minutes of flame and heat protection and it has a Robert’s Rating of gold 1 which means it has a high degree of theft, cracking and physical attack resistance. 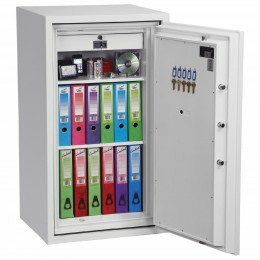 Whether you need a place to store exams for a few days before the big test or if you need some place to put them all year long, a good security cabinet is a good choice.